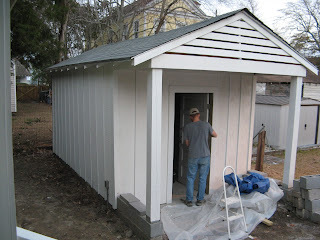 The shed is painted! It took the better part of the day, but there is a coat of paint on it! Below, you can see how far it's come. We started by moving the original front wall back 4' to create a small 'grilling' porch. We replaced all the siding and added battens, as well as giving the pediment the nice horizontal detail. Replaced the roof, poured a concrete floor, and gave it a new door, as well as running electricity out to it. Quite exciting! Brian has dubbed it "the dawg house". Really it's a place to store our bikes and grill, as well as a workshop for tools and such. And now we have the best looking shed on the block! It's still not completely done because there are battens that still need to be applied to the front (around the door and vent), and we still have painting to do under some of the overhangs, and the upper portion of the front wall. 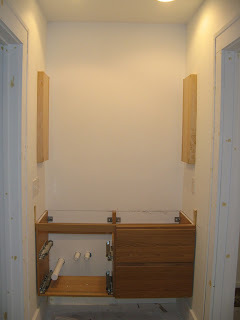 The door hardware needs to be installed, and any lighting. But at least we have a good base!